Free Download Patch My PC 3.3.0.1 latest version. Download Patch My PC new version from high speed direct download link. 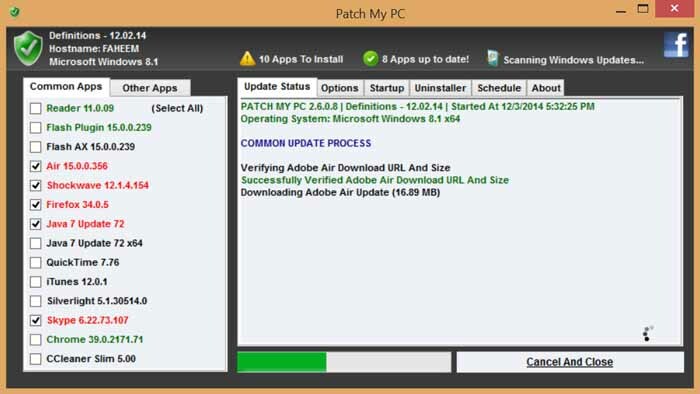 Patch My PC is an application software for your computer that keeps your PC up-to-date regarding your installed software. Patch My PC is a reliable and portable software that quickly check your PC for outdated software installed on your computer system. There are a large number of program that are supported by Patch My PC application such as Adobe Reader, Adobe Flash, Mozilla Firefox, Oracle Java, Apple QuickTime, Microsoft Silverlight, Skype and much more. This application is very easy to use and has a nice user interface. When you scan your computer, as a result, it will show all up-to-date programs in green colors while outdated in red. Its size is very small and in just KBs. This application is portable so works everywhere. It patches many usual third party products of Java, Quicktime, Flash and Reader. Patch My PC can scan and install windows updates easily. This is capable of uninstall multiple programs quickly. You can enable or disable any startup programs according to your choice and to reduce the startup time of your computer.